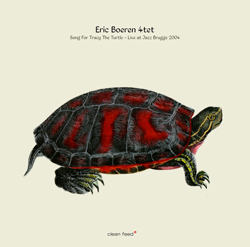 Cornetist Eric Boeren leads his Dutch quartet with a crisp, compact and expressive sound through a program that toggles between inventive bop, free-bop and avant expressionism on this live date recorded in 2004. With legendary British drummer Paul Lovens garnering the most out of his sparse kit and generating a sparky underpinning, the program is underscored by contrasting tones and a vibrant stance. Lovens and superfine bassist Wilbert de Joode literally have the beat on dynamics throughout the oscillating ebbs and flows. Boeren steers an exploration mission, yet the differentiator is that the musicians align and take full control along the way with a stylistic flair that yields the winning formula. The quartet works through unorthodox time signatures and elicits imagery of a bustling metropolis on Coleman’s “Moon Inhabitants.” And Moore tempers the flow via his buttery sax parts. Yet on other pieces such as Boeren’s spicy bop gala “Fuzzaphony,” the musicians render a jubilant mid-tempo groove, tinged with a touch of Coleman’s harmolodic sensibilities. Therefore, Boeren leads a world-class ensemble as the end results prove to be quite rewarding.